Before a photograph was a photograph, it was called a daguerreotype. Better than a Camera Obscura, the daguerreotype allowed a chemical capture of a stable image on a copper plate. While the quality was in no way comparable to the cameras in our phones today, the daguerreotype became the first success of humankind's efforts to visually capture our surroundings. The picture above is an example of an image captured by the inventor of the process, Louis Daguerre. 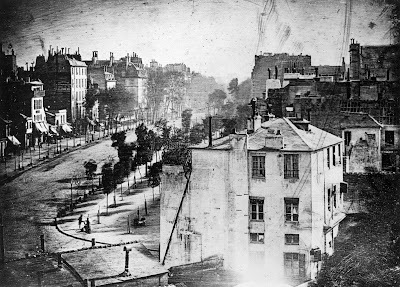 What was interesting about the picture above, in addition to it being an early daguerreotype, was the fact that it seems to have become the consensus for the first ever photograph of a human. Unlike the current freeze frame photography, early photographs had exposure times in excess of 10 minutes, and were better suited to landscape and cityscape photography. Which also meant that unless someone was absolutely still they would "ghost" out of the image altogether. At the bottom-left of the picture is a man apparently getting his shoes shined, and was therefore still long enough to appear on this exposure. Thus, unwittingly, becoming one of the first two humans to ever by photographed. Luckily, it seems that the art of long exposures to ghost out humans is very much alive and kicking.